I was in NYC this weekend and so I thought I would do some reconnaissance for my blog, because, you see, I've actually not spent much time in New York. Unfortunately, I ended up spending most my time on Madison Avenue and 5th Avenue which proved to be full of chain stores and tourists. Boring. 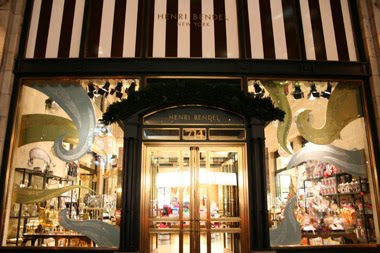 I was pretty excited to find Henri Bendel, mostly because I'd heard about it a lot on TV shows like Gossip Girl. Sadly, I was not so excited to be inside Henri Bendel. As far as I could tell, Henri Bendel basically sells crappy branded merchandise(like Bendel totes, flip-flops and umbrellas), make-up, unexceptional costume jewelry and headbands. In short, it was blahsville. According to IDR, Bendel's stopped selling actual fashion merchandise about a year ago...so even though I was willing to give them a little bit of a pass for being under construction, I'm starting to think that Bendel's is, in fact, not very exciting. Disappointing. Did you make it to Barneys? LOJO-really? I wouldn't have guessed that!